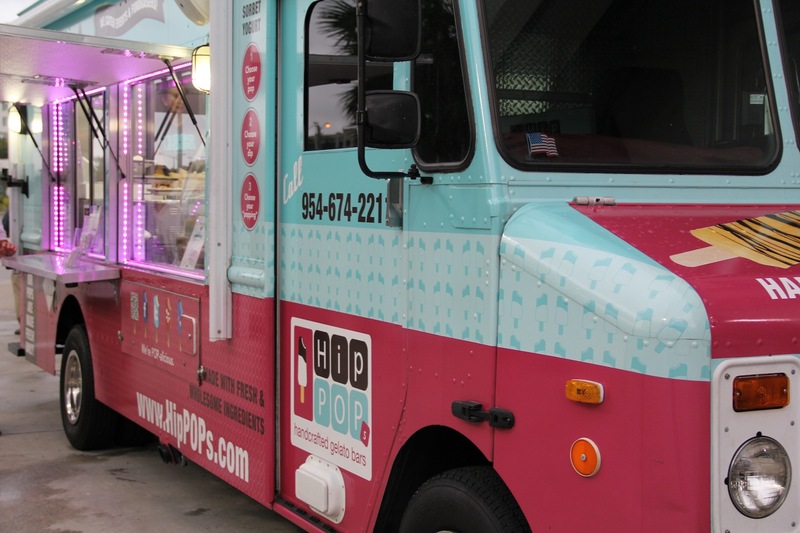 HipPOPS is a South Florida based food truck featuring inspired pops made with gelato, sorbet and frozen yogurt. They offer dozens of flavors, featuring 15-20 daily, including banana, blood orange, vanilla bean, mint, green apple wasabi, hazelnut, original tart yogurt, and tons of others. You can enjoy them “naked” or dip them in Italian chocolate – white, milk or dark – and choose from toppings (or “poppings”) including pretzels, sprinkles and almonds. We visited HipPOPS at a #TEAMAIME event in downtown West Palm Beach to experience their handcrafted awesomeness. I went straight for the AlmondJoy, a coconut pop dipped in dark chocolate and rolled in almonds. I loved this combination. The gelato tasted fresh and was nice and creamy and the almond added the perfect crunch. We also got The Godfather which was a pistachio pop dipped in milk chocolate and crushed pistachios. This one was a surprise for me.. I’m not normally a huge pistachio lover, but this pop was delicious! You can also get your pop made into a shake or served with a cup of hot chocolate. They are available to track down or by request for catering and events.